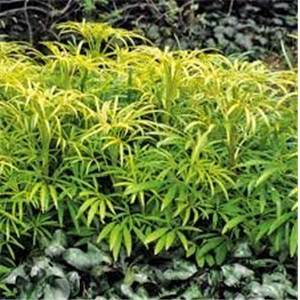 Helleborus foetidus Gold Bullion is an outstanding evergreen plant grown for its foliage. Tall stalks of golden, occasionally variegated leaves, that are brightest in the spring.in summer, the foliage becomes more chartreuse, with red staining on the stems. In winter it produces typical, large green candelabra-type flower heads. Evergreen. Hardy. Needs part or full shade to avoid burning the leaves. Height 0.45m. Supplied in a 9cm pot.